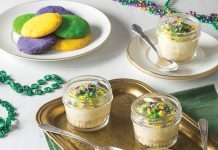 Ask any New Orleanian to pick “the best bread pudding,” and chances are you’ll be pointed to the light and airy version at Commander’s Palace. 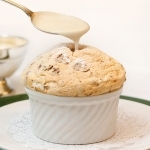 The humble bread pudding souffle comes in many forms, but there is a near-universal consensus that the Creole Bread Pudding Souffle from Commander’s Palace is one of the most decadent and exciting. 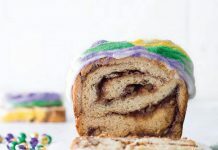 The “Grand Dame of New Orleans Restaurants” presents the classic dish, traditionally a mix of bread, milk, eggs, and sugar, in an inventive way that follows Commander’s tradition of “Haute Creole” fare. Airy French bread is whipped together with meringue to create the soufflé texture that makes it unique. The pudding is light yet moist, and notes of vanilla, cinnamon, and nutmeg stand up to the rich whiskey sauce poured on top. 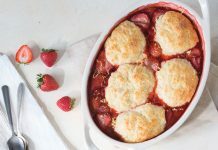 The dessert is so popular that Commander’s churns out thousands a month and has an employee whose sole job is to make the soufflés. 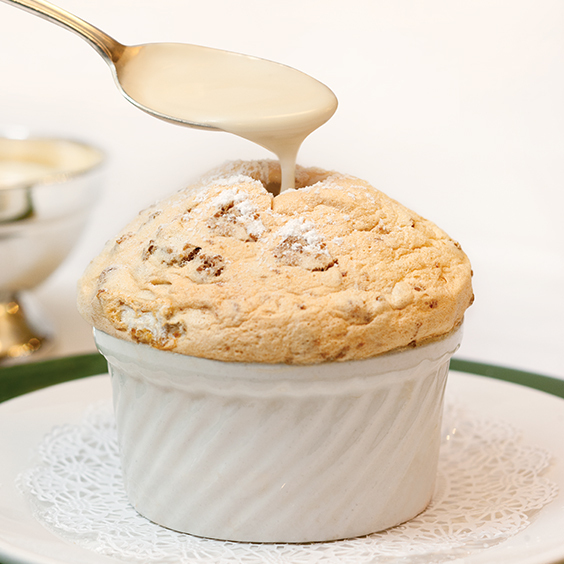 Servers present the soufflé in its whole form. Tableside, they use a spoon to create a portal through which the decadent sauce reaches all corners of the dessert. A light and airy bread pudding. Grease an 8-inch square baking pan with butter. In a large bowl, combine ¾ cup sugar, cinnamon, and nutmeg. Add eggs and whisk until smooth; add cream and vanilla, and stir to combine. Add bread cubes, and let stand until mixture is absorbed. In prepared pan, add raisins, and top with bread mixture. Bake until pudding is golden brown and firm to the touch, 25 to 30 minutes. (If a wooden pick inserted in the pudding comes out clean, it is done. The mixture should be moist, not runny or dry.) Let cool to room temperature. Grease 8 (6-ounce) ramekins with butter, and set aside. In the bowl of a stand mixer (or in a large bowl with a hand mixer), beat egg whites and cream of tartar at high speed until foamy. Add remaining ¾ cup sugar gradually, and continue beating until shiny and thick. Test with a clean spoon. If the whites stand up stiff when you pull out the spoon, the meringue is ready. In a large bowl, break half of the bread pudding into pieces using your hands or a spoon. Gently fold in ¼ of the meringue. Add a portion of this mixture to each ramekin. Place the remaining bread pudding in the bowl, break into pieces, and carefully fold in the rest of the meringue. Top the soufflés with this mixture. Using a spoon, smooth and shape tops into a dome over the ramekin rim. Bake until golden brown, about 20 minutes. Using a spoon at the table, poke a hole in the top of each soufflé, and pour room temperature Whiskey Sauce into each soufflé. Serve immediately. New Orleans French bread is very light and tender. If it’s not available in your market, substitute a light Italian bread. In a small bowl, combine cornstarch and 1 tablespoon water. Whisk until combined. In a small saucepan over medium heat, add cream; bring to a boil. Add cornstarch mixture to cream while whisking; return to a boil. Whisk, and let simmer a few seconds more. Remove from heat. Stir in sugar and bourbon. Taste to make sure the sauce has a thick consistency, sweetness, and a good bourbon flavor. Cool to room temperature. Yummy-melt-in-your-mouth-goodness! First, I do NOT like bread pudding. I’m always afraid I’ll get that big bite of ooey gooey bland something or the other full of raisins that don’t “feel” like raisins traveling across the tongue, again. However, when my husband finally convinced me to try this bread pudding, during a wknd trip to N.O., it was lovely. Texture, flavor and consistency were perfected by CP. The only reason I’d even think twice about making these little ramekins of yummiliciousness (IK there’s no such word) myself, is if I was in the far reaches of frozen Russia, to far away to make it to CP. 😀 Enjoy! Whether in N.O. or at your humble abode! Do you have recipe for oven baked cornbread dressing? I will definitely like to try this…I like using various breads and trying with completely different textures to find what I like. I have used a caramel sauce but this recipe sounds by far the best!Thank you for posting.